Turn to any of five hundred poems written between 1925 and 1965 by W.H. Auden and, heavily as you might swing your critical hammer, the material you strike will ring like a fine bell: coherent in expression; on key with the time of authorship; and with ironic overtones to reinforce their overall effect, from "A Summer Night" to "Letter to Lord Byron" to "Dover" to the later "Shield of Achilles." Some critics were disturbed by this and described Auden as "facile," as if competence were a sin real artists didn't invest with the expenditure of talent. And of his older contemporaries, it's hard to imagine Robert Frost, the author of such stark stories in blank verse as "The Fear" and "The Black Cottage," chatting in a club with a man of such ironic sensibilities as Auden's, even as an allegedly committed leftist in the 1930's. Yet, think of poetry between 1910 and 1965 in English without either one of them. It is as hard to imagine as an Elizabethan age without Donne and Shakespeare. And it is harder to imagine that empty space than it is to imagine the same world without T.S. Eliot and Ezra Pound, who fostered the reputations of both. Must you keep writing poetry? Still half-imbedded in the oozy clay? Contemplating a children's toy could swiftly turn into a maudlin recollection of "that Elmo I had" or slapstick about "how Spot ate Raggedy Anne and Andy." However, you'd never mistake Martin's approach for slapstick; and maudlin isn't this poet's way. Turning the old toy in his hands, the narrator of this poem rolls back more than years, turning up a peculiar evolution, from dead dinosaur to tar pits to plastic dinosar made from the oil that is the chief artifact of its ancestors. These chains of chance (or polymers, in this instance) are all around us; their results bind the staircase of DNA and anchor the landscapes on which we walk. The late Carl Sagan took the view that this was an astonishingly beautiful dance of billions of molecules, a point of view hard to suppress when you begin to see these processes as a great concert. Martin will have some of that, but not that much. Is it really so wonderous, this great symphony? Is it possible to see accident as either marvelous or tragic? Martin suggests, as have many predecessors, that it is not. In A Walk in the Woods above the Artist's House, midway through part I, the narrator discusses Philodemus, a minor Roman philosopher whose life and work were subsidized, in effect, by the merchant Piso, who set him up in a villa in Herculaneum, a pretty place that inspired the author to thoughts on "art's supremest good." Vesuvius cried, "Hold that thought!" On notions long kept out of sight. And can I freshen up that drink? We are what passes, not what stays. Where this poem goes next is yours to find for, as much as it might be liked, one can't quote more without cheating both the author and the reader. Survive all cries of "What did he just say?" We are like that narrator, variously on the scent of the latest remake of some Weimarian and faded archetype and then rebuking the artist who sprayed it on a wall. We can't escape the strength of Beckett's shattered view, nor that it seems to frame a picture of world that is not one we really recognize anymore. At Endgame where do we go? Not the end, certainly, but not that long departed beginning either. 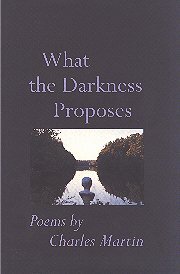 What the Darkness Proposes, Martin's fifth book, takes exploration to enjoy but it is highly recommended. It's available or can be ordered in most bookstores or, if all else fails, directly from Johns Hopkins. In a short time, it should be available at Amazon and you can order it here.